TEAM REGISTRATION Captains will register their teams with Union Arena and be responsible for making sure all players complete the online registration via below links. Captains will pay the team fee and collect directly from their players. Team registration deadline is September 14, 2018, all players must be registered before they step on the ice. It is our goal to produce schedules by the end of September. All Leagues play a 20 game season (including playoffs, if applicable). Part-Time Players are welcome on a team by team basis. Refund Policy: There are no refunds for players or teams who quit or are suspended or expelled from the league. ‘A’ Level Players should consider the UVHL on Tuesday nights. Go to www.UVHL.com for more information. Note: A Level players age 30 and older may also play in the UAHL B League. 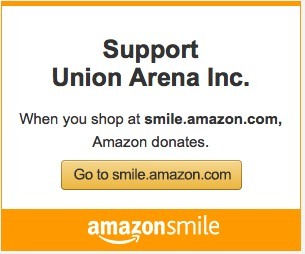 UAHL: Union Arena Hockey League – ‘B’ League. There will be 6-8 teams in the league. The 2018-2019 schedule will typically have all games on Thursday evenings, with additional games scheduled for other evenings if needed. Underage player rule: ONLY two 21-29 year-olds (1989-1997 birthdates) are permitted, and they must be ‘B’ level players. The Vermont Law School is exempt from this rule. Players born in 1989-1997 who are ‘A’ level are not permitted in the UAHL. They can play in the UVHL ‘A’ League. As a guideline, players who played competitive high school, junior or college hockey would be classified as ‘A’ level players. ‘A’ Level players who are 30 and older may play in this League. The season starts the week of October 15 and playoffs will conclude in mid-March. Men over 40 as well as beginner or novice players over 21. Women over 21 of any level or ability. Note: Teams are encouraged to have a mix of male and female players. This is a FUN hockey league. The league respects and welcomes players of all abilities. Talented players are expected to play in a manner that is inclusive (in other words, tone it down!). Aggressive and intimidating play will not be tolerated. Games will be held Wednesdays and some Mondays/Fridays. Game times will generally be 7:50 and 9:10 pm. The season starts the week of October 15 and will conclude in late-March. New players are encouraged and very welcome! There will be four teams in the league. Rosters are open to women of all ages, abilities and experience. Games will be every Sunday at Union Arena at 5:30pm and 6:45pm. Season starts the week of October 15th and will end in March.